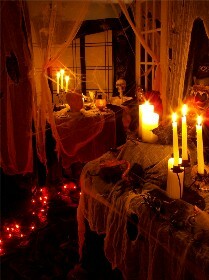 Inside a Haunted House: This is the inside of a haunted house. A skeleton lives heres. He likes candles. Maybe he is afraid of the dark. Maybe he is afraid to Halloween monsters and ghosts.